In the last few years, I’ve had an increase in the number of customers at Wild Birds Unlimited here in Grosse Pointe Woods who come in and report that they have a Red-headed Woodpecker at their feeders. Knowing the status of that bird is unusual in Michigan, I show them a picture of both Red-headed and Red-bellied woodpeckers. After seeing both, most people realize they in fact saw a Red-bellied and not a Red-headed Woodpecker. It s far less common to have the latter bird in this area (though certainly not impossible!). In the case of the Red-bellied, it does in fact also have a red cap, which makes the nomenclature slightly confusing. 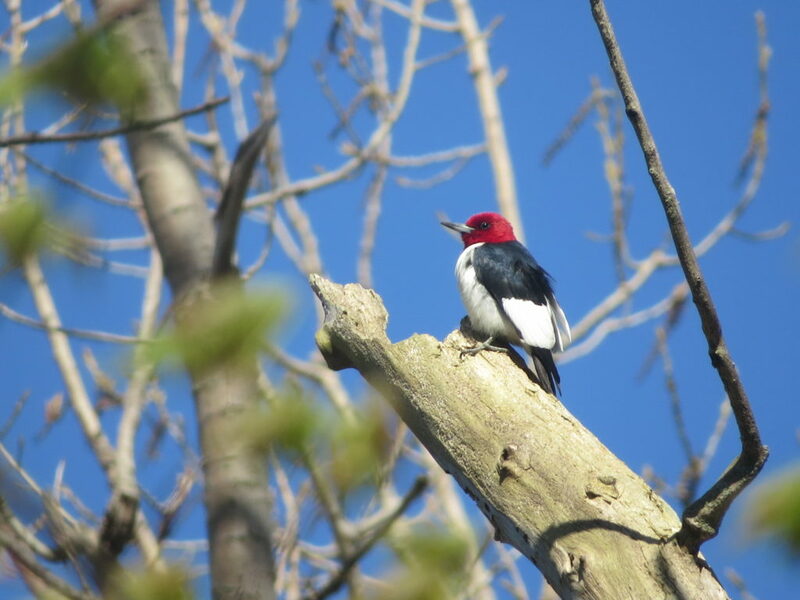 Perhaps at the time of the Red-bellied’s discovery, the name “Red-headed Woodpecker” was already taken. This type of discovery would have been made after the bird was shot to be studied. Luckily, these days, binoculars have replaced guns in the study of birds, and through them we can see the red blush of the Red-bellied woodpeckers’ belly. Red-bellied Woodpecker (Melanerpes carolinus) is 9.25 inches in length, has a wing span of 16 inches and weighs 2.2 oz. With a white belly, distinctive black and white stripes on the back and a bright red cap, this bird is a welcome addition to the sightings in your yard. The red on the male covers both the crown and the nape of the bird, whereas in the female it is restricted to the nape. In flight, the wings move in a deep undulating flight. One of the most interesting facts that I have read about this bird is that it has 36,000 to 37,000 feathers to insulate it. (Just how do they come up with those statistics?) The male Red-bellied Woodpecker has a longer bill and a longer, wider tongue tip than the female. These adaptations may allow the male to reach deeper into furrows to extract prey and may allow the sexes to divide up the resources in one area. The Red-bellied is a nut eater, frequenting deciduous and mixed woodlands forests and usually ranging south of boreal forests. It eats three times more vegetable matter than insect matter and is known for its propensity to store food, using its long tongue to push food deeper than chickadees, titmice and blue jays can reach. It is known to eat arthropods, seeds, fruit, sap, and occasionally lizards, tree frogs, small fish, nestlings, birds, and eggs. The manner in which it feeds is to glean for insects from bark; probe and excavate into dead wood; hawk for flying insects; and hang upside down for berries. The Red-bellied Woodpecker is a primary cavity nesting bird, laying white eggs as most cavity nesters do. They don’t re-use cavities, which is important because the nest holes are then used by a large number of other birds, including flycatchers, wood ducks, screech owls, and bluebirds, to name a few. Nesting begins in late April and early May with the young fledging the cavity by June or July. European Starlings have an intense impact on the Red-bellied Woodpeckers’ nesting success, as the aggressive, non-native species runs the woodpeckers out of their cavities. The range of the Red-bellied is widespread throughout the southeast. The Birds of Michigan by McPeek and Adams classifies the range of this bird as becoming considerably more common in Michigan in recent decades. 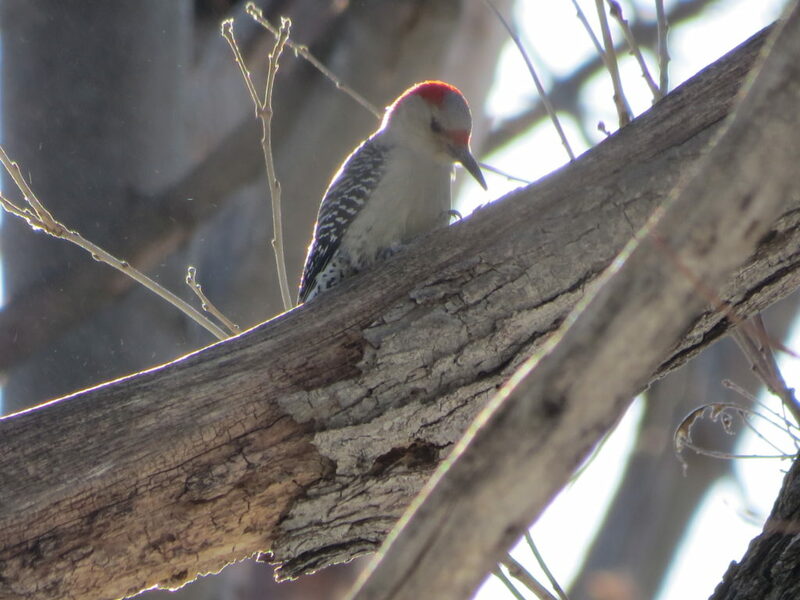 In the early to mid-1900s, the range of the Red-bellied Woodpecker ended around the middle of the state, but now it occurs throughout the Lower Peninsula, though still uncommon in most of the northern counties. The increase of this bird’s range northward is due to a number of factors. As Red-bellied populations grow in the south, there is a greater need for ranges to expand in order for birds to establish sufficiently sized territories. Increases in people who feed the birds, as well as above average winter temperatures for several decades, and forest regeneration in parts of the Lower Peninsula all add to the increase of this species. The Christmas Bird Counts confirm a steady rise in the population. Sightings of this bird in the winter are more regular as birds wander in search of food. Red-bellieds will cache food in a cavity, stocking it with acorns, nuts or sunflower seeds, which adds to their survival rate. “They eat Black Oil Sunflower out of the tray feeder on the ground all the time”. .
“They love pure sunflower chips best of all, with peanuts second, and suet also”. “They prefer peanuts, suet and striped Sunflower”. 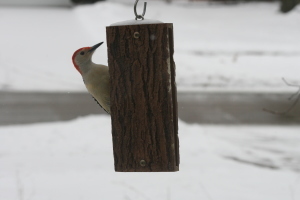 “Red-bellied woodpeckers like peanuts, striped sunflower, and suet”. Judging by these responses, a well stocked feeding station should increase the odds that you will be host to the sight and sounds of this handsome woodpecker.